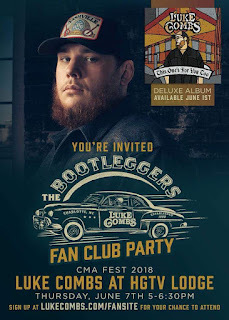 Luke Combs to Hold Bootleggers Fan Club Party During CMAFest 2018! Luke Combs has announced that his 1st ever Bootleggers Fan Club Party will be held on Thursday, June 7, 2018 at 5 PM at the HGTV Lodge! Registered members of the Bootleggers Fan Club may log in to their accounts to enter for a chance to win tickets for this exclusive event! Visit www.lukecombs.com/fansite to join or enter the contest!